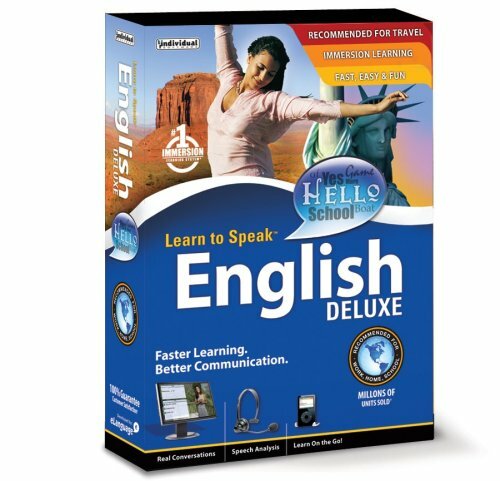 ENGLISH Deluxe 10 - Training Video ! 2.16 GBVersion 10 - Just Released! New Features* Improved user interface* All new Media Center* 5 new language workshops: conversation, pronunciation, simulations, vocabulary and grammar* Custom lesson planning* Interactive vocabulary games* Enhanced speech analysis tools* Improved scoring and program tracking* Additional Online Content* Windows 2000, XP, VistaLearn English FastLearn to Speak is simply the fastest and most effective way to go from novice level to language mastery. It was designed by university language professors who combined state-of-the-art learning theory with proven classroom practices to create the Flexible Immersion System. Move easily from learning useful words and phrases to exploring scenario-based conversations. Then polish your new skills with advanced speech recognition and analysis tools. The result is a rapid language-learning approach that is used by millions of people around the world.FLEXIBLE IMMERSION SYSTEM?Exclusive to Learn to Speak, the Flexible Immersion System lets you choose the learning path that matches your individual learning style. Our unique method gives you the real-world context and support to make immersion truly work. Converse with native speakers using our engaging interactive videos and speech recognition tools. The proven and effective lesson design also gives you the grammar and vocabulary foundation you?ll need to achieve conversational fluency.